MEMPHIS, Tenn.--(BUSINESS WIRE)--With thousands of fans and pop culture enthusiasts in Memphis for King of Rock ‘n’ Roll’s™ 84th birthday celebrating the life and career of Elvis at Graceland®, music fans and collectors in Memphis and around the world participated on site and online in hopes of going home with a piece of Elvis history at The Auction at Graceland, which brought in over $600,000 today. 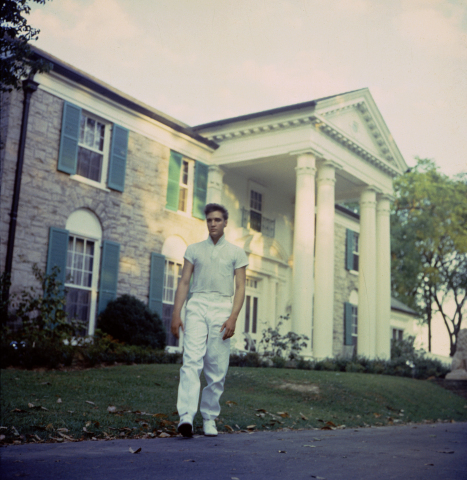 Presented by Graceland Auctions, the auction was held at the The Guest House at Graceland. A portion of the auction benefited the Elvis Presley Charitable Foundation (EPCF), a 501(c)3 organization. The auction featured rare and unique artifacts expertly authenticated by Graceland Authenticated, including memorabilia from Elvis’ personal life, prized jewelry pieces and attire. Highlights and sale prices included: a custom made Red Velvet Shirt likely worn on stage for the 1956 evening show of Elvis’ famous September 1956 show in Tupelo, Mississippi - $37,500; a Gold and Diamond Ring that Elvis wore on stage and gave to his father Vernon - $30,000; an Elvis owned Diamond and Gold Ring that he gave to J.D. Sumner - $22,500; Elvis’ Electro-Voice Microphone - $17,500; Elvis’ Turquoise and Silver Ring - $11,875; 1956 Love Me Tender theater lobby standee, a rare movie artifact - $11,250; Elvis’ Blue Winter Ski Jacket-$10,625; a pair of 1955 color slides of Elvis performing in Austin, Texas on the Louisiana Hayride Tour - $10,000; and much more. For a complete list of all items and final sale prices visit http://auction.graceland.com/catalog.aspx. All of the prices realized include a 25% buyer's premium. For more information about how to submit items for authentication by Graceland Authenticated, please email authentication@graceland.com. To have an artifact considered for inclusion in future Graceland Auctions, please email consignments@graceland.com. Elvis Presley’s Graceland, in Memphis, is music’s most important and beloved landmark, with hundreds of thousands of fans from around the world visiting the historic home each year. Elvis Presley Enterprises, Inc. (EPE) manages the operations of Graceland and its related properties, including Elvis Presley's Memphis, Graceland's new entertainment and exhibition complex over 200,000 square feet in size; the AAA Four Diamond Guest House at Graceland 450-room resort hotel; and the Graceland Archives, featuring thousands of artifacts from Elvis’ home and career. EPE also produces and licenses Elvis-themed live events, tours, and attractions worldwide. Graceland Holdings LLC, led by managing partner Joel Weinshanker, is the majority owner of EPE. Auction A Circle and Graceland Auctions TNGL#5967 is the entity that manages Auctions at Graceland. Graceland is the only attraction worldwide to ever receive five USA Today 10Best Readers’ Choice Awards: in 2018, it was voted “Best Tennessee Attraction” and Best Holiday Historic Home Tour, in 2015 voted the world’s “Best Musical Attraction” and “Best Historic Southern Attraction,” and in 2013 voted the #1 “Iconic American Attraction.” In 2018 TripAdvisor Travelers’ Choice Awards named Graceland one of the top 25 landmarks in the world and Rolling Stone named it one of 10 Great American Music Landmarks. For more information on EPE and Graceland, visit www.graceland.com. Collectors in Memphis and around the world participated on site and online in The Auction at Graceland which brought in over $600,000 today.